The first thing you notice about the Filofax Personal Fusion is how light it feels in your hand. It is a very strong yet sleek Filofax. My first impression was – ‘Now there’s a Filofax I can take to the football, business meetings and it would be great for the busy parent’. I really like black binders, and the materials used to create the Fusion left me intrigued. I HAD to touch it. The cover is made from a strong microfiber combined with full grain leather band. The stitching is a mid-brown. The specifications say it has a width of 155mm, height 192mm and depth 42mm. Holding it all together is a rather long and sturdy leather strap that inserts into the front cover. It is ready to hold everything including those bulging-at-the-seams days. The newly arrived Fusion came in the more contemporary plastic dust cover. 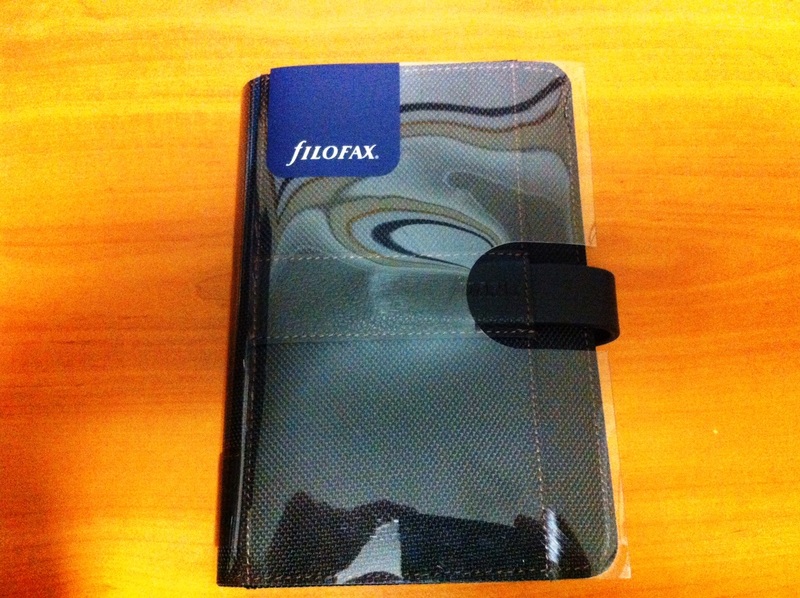 The outside spine contains the familiar Filofax logo and a stamped Filofax on the strap closure. The front contains two small slip pockets on either side of the strap while the back has a large, full length slip pocket which is kept secure by the strap when the binder is closed. Opening the Fusion, you see it lies quite flat. The cover is stiff yet still flexible. On the inside front cover is a generous smartphone holder opening to the right with an expandable elastic siding. I tried placing my Phone 4 inside and it accommodates it well. When closed, the whole binder remains secure despite having the phone inside. It’s a great innovation and the uses for the busy owner will be endless. Also on the front inside cover are three credit card pockets and a long vertical pocket. These are quite easy to use and keeps all types of cards in position. The Personal has the usual 23 mm rings. The lining of the inside is a combination of black polyester lining with a microfiber and leather interior. The personal comes with the generous printed papers. On the inside back cover is the standard notebook pocket and a rather terrific elastic pen loop. I tried a few different pens and it seems to handle them all no matter what size and width. When closed, the pen is positioned to the side that does not make the pen press into the paper. While it is closed, the Fusion holds everything snug and secure. I tried stuffing it with as much paper as the rings could handle and the leather strap worked well to hold it all together. On the outside, the fusion looks great. It would match a whole range of bag accessories. My teenage son said it looked like something that would match and fit inside a camera bag. He then asked me if he could have it. That’s the best compliment for this Filofax. It has a contemporary look and feel about it and, at the same time, would be just as much at home in a business meeting. For the price of £40 for the Personal and £56 for the A5 with 30mm rings, the Filofax Fusion ticks almost all my boxes of what I admire in a good planner. Well worth the look, and well worth the price. 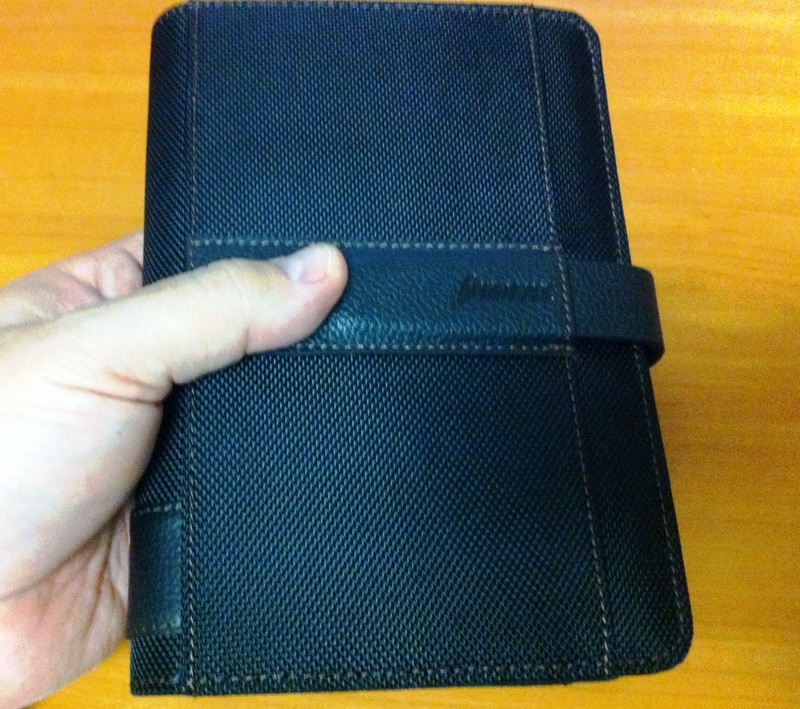 A special thanks to Filofax UK and Ideas Network for providing the black personal fusion for this review. Those are the same 1-6 dividers that came with my Personal Apex. What do you think of the colours?